Hookworms are intestinal parasites that are common in dogs, and while most infections are not life-threatening, one species that can cause fatal blood loss in puppies. There are three hookworm species that affect dogs, and some can also affect humans by migrating through the skin. Hookworms are small, thin worms that are less than an inch long. The appearance of the mouthparts vary by species, but all hookworms have hook-like teeth or plates. These structures help them attach to the intestinal wall. Unlike roundworms, which just float around and steal nutrients from the dog's meals, hookworms attach to the intestinal wall and feed on blood and/or tissues. They can detach and move to other spots, leaving little ulcers where they have previously fed. The severity of symptoms varies among the hookworm species, but the most serious one is Ancylostoma caninum, which can cause anemia due to blood loss in puppies. This condition can kill very young puppies. They can be ingested directly, as when dogs lick the ground or groom themselves when larvae are present on their fur. They can migrate through the skin, usually through the belly or paws. They can be ingested by another animal such as a rodent, and then be ingested by a dog that eats the infected animal. Puppies can also be infected by larvae present in their mother's milk. Once the hookworm larvae get into a dog, they may develop into adult worms while living in the intestines. They may also migrate through the tissues to the dog's lungs where they are coughed up and swallowed, and then finally develop into adults in the intestines. In older dogs, migrating hookworm larvae commonly enter a dormant state within in body tissues and can become mobile again later. The larvae commonly become active during pregnancy, which is why they're common in puppies. Some kinds of hookworm larvae can go to the mammary glands. Others develop into adults in the mother's intestines, producing eggs which act as a source of infection for puppies. The symptoms vary depending on the species of hookworm involved, as well as the number of worms and the age and health of the infected dog. The eggs of hookworms can be detected under the microscope in a routine check of a stool sample. It takes a while for infected puppies to shed eggs, so routine deworming of puppies is recommended, even if no signs of hookworms are yet visible. Treatment is the same, regardless of the hookworm species. There are a number of medications that can be used and your vet can help you pick the right one for your dog. Medications will only affect hookworms in the intestines, not migrating larvae. Treatment should be repeated to deal with larvae as they mature. For instance, the vet may recommend treating at two-week intervals. The number of treatments necessary will depend on the age of the dog and its particular situation. If you have a pregnant dog, consult your vet for a deworming protocol for both the mother and pups. Once dewormed, many of the monthly medications designed for parasite control contain medication that will prevent hookworm infections on an ongoing basis. If your dog is not on one of these preventatives, your vet will recommend a regular deworming protocol to keep hookworms at bay. Keeping pet wastes picked up and preventing pets from eating rodents can also help prevent infection with worms. The larvae of hookworms can infect people as well as dogs, which happens when eggs are ingested. The larvae usually don't develop into adult hookworms in people. However, the larvae migrating through the skin can cause irritation and inflammation, though most cases are not serious. Migration of hookworm larvae through human skin is called "cutaneous larva migrans." There have been cases where one kind of hookworm took up residence in the intestines of humans, as well. Proper treatment and prevention of hookworm infections are important to prevent these human health concerns, as is good hygiene. 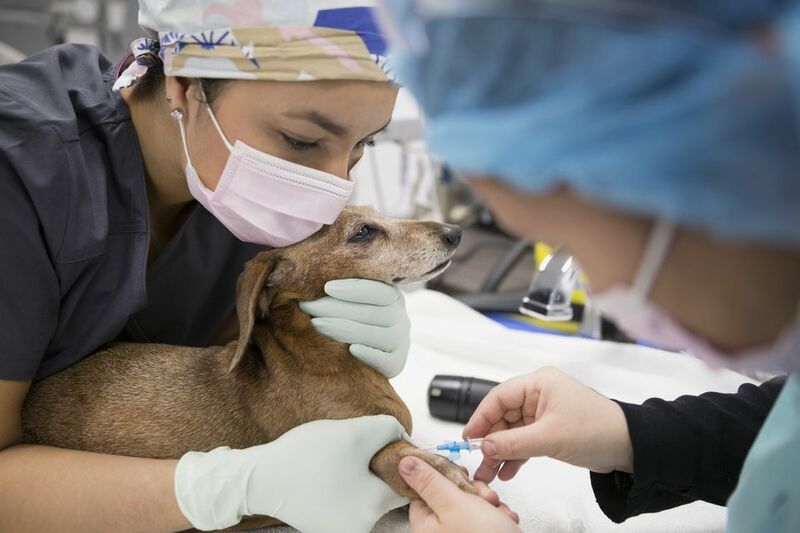 The same protocols that can prevent hookworms from spreading from dog-to-dog, namely cleaning up waste, can prevent humans from becoming infected.